The all-new Victor Jr. Ford heads have a 500+ horsepower potential, out-of-the-box, for an affordable, race-winning set-up. They feature large volume, high-flowing 210cc intake ports and .130'' raised 75cc exhaust ports. Designed to work with standard port location manifolds and headers, these heads have CNC gasket-matched port entries and exits with blended valve bowls. The spark plug holes and valves are in the stock location with a valve cover rail that1s raised .150''. Complete heads come with stainless steel, 1-piece, swirl-polished, under-cut stem valve (2.05'' intake/1.60'' exhaust) as well as phosphor bronze valve guides. Note: Aftermarket 289/302 heads including Brodix, Edelbrock, Ford Motorsport and World Products with 1/2'' bolt hole diameters (block is 7/16'' bolt hole), except 397-M-6049-P303 (''P'' style head). Require 350-9680 inserts with 350-8552 head bolt or 350-9680 insert with 070-154-3601. If head studs are desired use 070-154-4005 (includes inserts). Tech Tip: To gain more spark plug clearance, Edelbrock recommends using Champion RC Series plugs such as the RC12YC (P/N 192-49776). They are 0.230'' shorter than a conventional spark plug and have a 5/8'' hex for easier access. Victor Jr. Series Heads are perfect for OE-Performance engines with stock valve train and pistons for bolt-on performance. 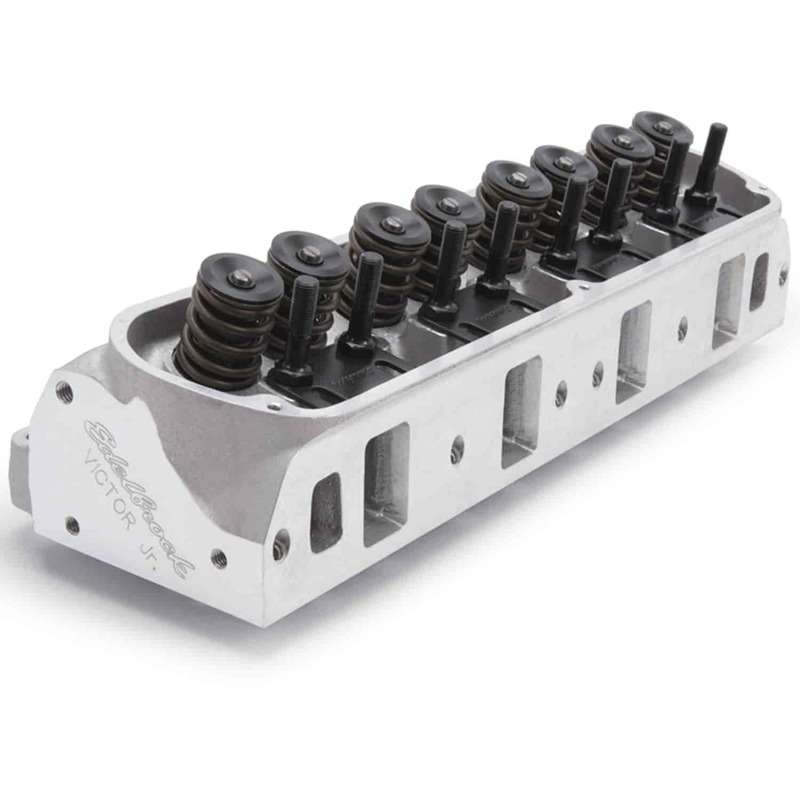 Available as a complete head which includes valves, springs & retainers or as a bare head so the valve springs can be matched with recommendations from the camshaft manufacturer. Victor & Victor CNC Series Heads are designed for use in racing applications. Some of the best racers in the country rely on Edelbrock's Victor and Victor CNC series heads to help them win the race. These heads feature raised runners, revised combustion chambers and relocated valves for all-out performance in competition engines. Valve Stem Diameter 11/32" 11/32"
Exhaust Port Location Raised .130" 2.5" Spread; Raised .520"